Tee's Blurbs: and what a weekend it was! i wasn't listening to the instructions on how how put back the coaster back to it's original angle so Kareen and i were on the 55-degree angle all throughout the ride. let me just say i spent the entire time gripping on the handle for dear life with the thought "i hope nobody fell down from this because i sure feel like i'd be the first". to describe the experience in just a sentence: longest 10 minutes of my life and i can't imagine myself doing it again. once was enough, thank you very much. 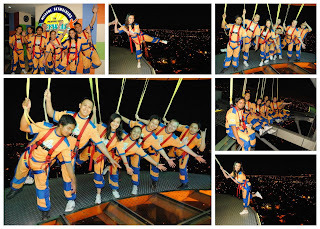 :D i had fun doing the Sky Walk, though. it was a very long wait for just 10 minutes of walking around the building, but i didn't mind. 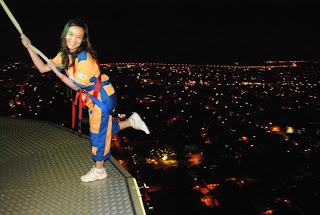 the view - night sky, city lights, and the SRP strip was enchantingly beautiful that you can't help but be awed. i just might wanna try the sky walk again at daytime and see what it's like. so here's me on the edge with my choreographed pose: i was trying so hard to imitate the leg pop in princess diaries, haha. 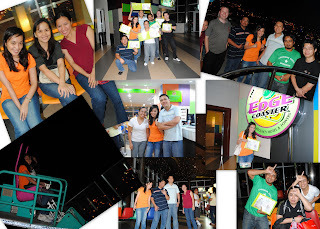 that night was really a fun-filled night with all the bloopers and experiences with the teammates. finally, the long overdue photoshoot with nyster pushed through. i've always wanted to have my portfolio taken due to my model frustrations, and this was hitting one of my bucket list to-dos too. 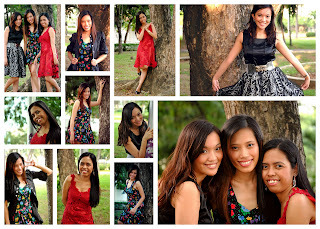 erica, dee and i prepped ourselves for the shoot done at cebu business park. let me just end by saying: it was so fun but at the same time, very draining. therefore i conclude: a model's life is not all that easy. it is really, talent and hard work. i'm afraid i don't have both. :P and because we were hungry from all the preparations and the shoot (that we gobbled the cotton candy that was supposed to be in the shoot and that left us nothing as props), we went to a korean resto in mabolo. the food was delish. it was my first time to try Samgyeopsal. it's a must try!